Successfully Added ATI Radeon HD4650 128MB PCI Express x16 Graphics Card to your Shopping Cart. Video graphics card based on the high performance ATI Radeon HD4650 chipset with 128MB of memory, using a standard PCI-E 2.0 connection. 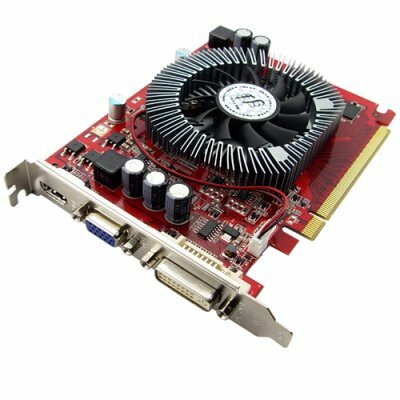 Upgrade your graphics performance with this superb ATI Radeon HD4650 128MB Dual DVI PCI Express (16x) Video Card. With key features such as its dual DVI-I ports, HDMI/DVI/VGA, and full Microsoft DirectX 10.1 Shader Model 4.0 support, this card is ideal for both high-end gaming or home video enjoyment. Super charge your PC's graphics with fantastic image quality and 3D graphics capabilities. All of the key features of modern PC games are supported including HDR with FSAA, 64-Bit Texture Filtering and Blending and full DirectX 10.1 support. With full support for CrossFire, turbo charge your games with two of these cards. An exceptional graphics card with 128MB of on-board GDDR3 memory and a memory clock speed of 1200Mhz, this is a must-have upgrade for demanding 3D games - perfect for today's popular first person shooters and strategy games. With the incredible performance of this Radeon HD4650, stay ahead of the competition in online and LAN gaming. With the increasing complexity and detail of today's games, choosing the right video card for your needs is more important than ever. Enjoy high screen resolutions and smooth, high frame rates powered by this affordable card - the ATI Radeon 4650 chipset easily handles the demanding workloads of today's PC users. Enjoy flawlessly smooth video playback on your PC, enhanced with vibrant colors, sharp images, and universal TV and display connectivity delivered by the acclaimed ATI AVIVO HD technology. Be thrilled by immersive high definition big-screen PC gaming, and view ultra high quality photo images and Internet videos. Get universal connectivity support for HDTVs and high-res PC displays, with HDCP1 support for reliably playing the latest HD entertainment. The card would also be perfect for the modern operating systems such as MS Windows Vista to ensure you enjoy all of the rich graphical features such as Aero. Excellent for responsive 2D browsing, this single slot card is also the ideal solution for HD video and provides dual monitor output to enhance both your productivity and multimedia experience. Multitasking between applications has never been easier with Windows Aero, the new visually-rich 3D user interface built into Windows Vista Premium and Business editions. This is a great product at a direct to you wholesale price makes this perfect either for the resale market or personal/company use. As always, it is available right now from your source for wholesale direct from China electronic products, Chinavasion.